This informative 32-page, 8 1/2 x 11", color brochure is an excellent introduction to aerospace history since the Wright brothers' historic flight in December 1903. To request a copy of this brochure. and information about the Commission. 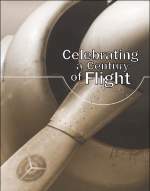 The first Centennial of Flight brochure used many of the same images and messages as our portable centennial exhibit, including a timeline of aviation and aerospace history. 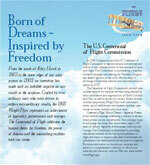 This first brochure is only available by downloading from this Web site.